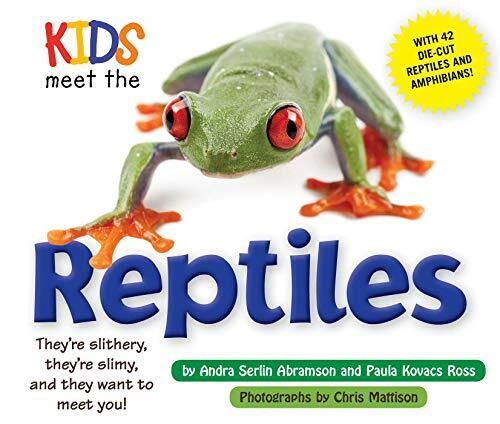 Kids Meet the Reptiles features reptiles from all around the world in this fun, lay-flat edition, with each reptile showcased on a full-color 2-page spread complete with die cut. <p></p>Each two-page spread features a slimy, slithery reptile, with creatures from all around the globe profiled with spectacular photographs by famed nature photographer Chris Mattison. Kids will get a personal introduction from the reptile, plus fun facts about its habitat, food, and life cycle. Photographer Chris Mattison is well known for his up-close-and-personal look at some of the Earth's most amazing creatures. The author/illustrator of numerous adult books on the subject of snakes, including The New Encyclopedia of Snakes and DK's Snake book, Kids Meet the Snakes, is the first time his incredible photography will be featured in a book for kids. Andra Serlin Abramson is the author of more than a dozen non-fiction books for children including 6 books in the UP CLOSE series (Race Cars, Fire Trucks, Submarines, Fighter Planes, Heavy Machinery, and Ships) and 2 books in the INSIDE series (Dinosaurs and Stars). She lives in Gaithersburg, Maryland.